Most women would love a free facial and you can have one through Skintel products! It’s easy. Simply purchase Skintel products worth Php 250 and enjoy a free facial service. Most dermatological clinics would charge the same fee for a basic facial with no additional services but with Skintel, you get a facial and will bring home and use their products at the same time. Some items you can purchase for this deal include whitening products like soaps, creams, and lotion as well as hair products. Skintel is a skin care line of products manufactured by Philippine based DermPharma. 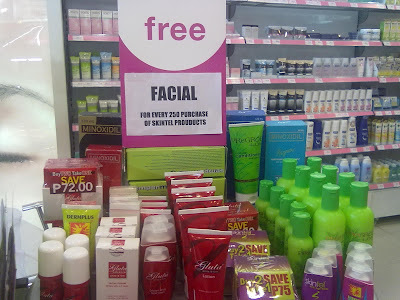 Catch their free facial service periodically through Watsons and SM Department Store at SM malls nationwide.